Eric John Cooper was born 30th October 1939 in Thundersly Essex. The ethic and impetus of the Coopers was and remains being actively creative for the general public. 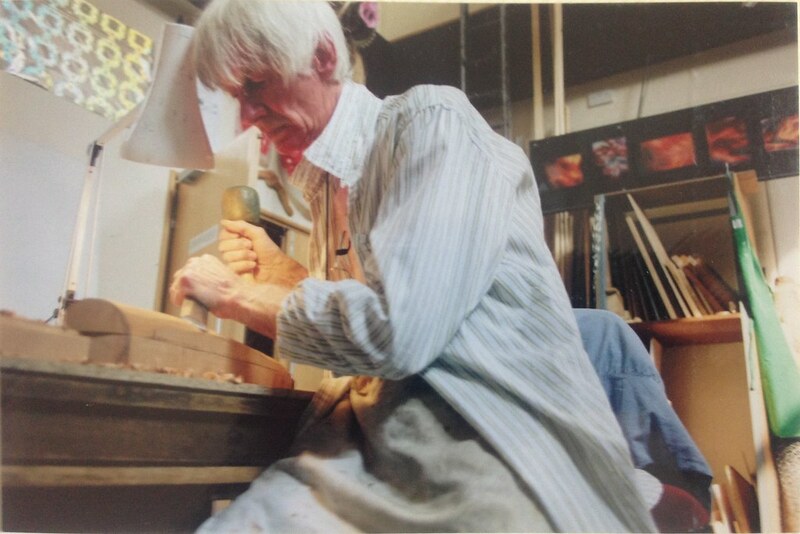 His father, Eric, was a shipwright, wood carver, puzzle maker and lyre player. His mother Mona Johnson, ran the San Toy Dancing School for 60 years and was always surrounded by many children and their families. Eric had six uncles who where all very artistic and creative. His great grandfather was a photographer and a clock and jewellery maker in the late 1800’s early 1900’s. Amongst the first things Eric ever saw were his father’s drawings, models and the real thing in the shipyards. His visual cortex was thus programmed to resonate with geometric wave and hull forms for they continually emerge in all his creative work, whatever the materials, whether it be in stained glass, carving, illustration, letter forms, theatre design or lighting. As a child Eric grew up on the stage. He was a trained choirboy and would sing in the intermissions of the shows that his mother put on with her dancing school. His father would design and make the sets. He is inspired and entranced by Viking and Moorish creations, long ships, gondolas, Cistercian and gothic stonework and the ethereal luminosity of the Alhambra Palace in Spain. A major influence in his creations is the unequalled astonishing achievements of vanished civilizations that suggest familiarity with knowledge now lost and their science of geometry and structure. Eric draws on these laws that dominate our universe and their eternal reality. He creates works that manifest this aesthetic and they affect all that see them in the same way. It speaks to the soul of an eternal reality, which unites us all, his work is harmony crystallised and made visible. If you are interested to know more, you can read Eric's story in his own words.